and three months past their estimated life span. tire tracks from the good side of Sprit on the left of the furrow. But who? Or what? 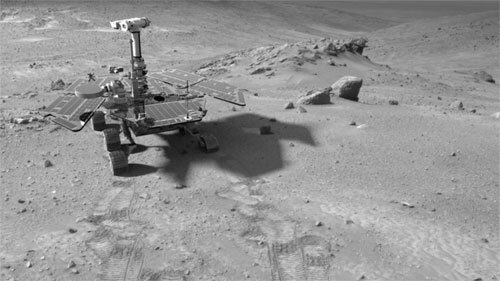 You might ask, took this photo of the Rover? sent the Rovers to opposite sides of Mars to explore most efficiently. a 3-D model of the rover and a real image of Mars taken by Spirit. dish on the left is how the Rovers send photos and data back to Earth. more and their signals will fade away as they freeze up and stop working. most successful space geologists we have made to date. ← Got into NYU's Tisch ITP program!